The report defines areas where the pioneering businesses were moving in the SDG space and identifies new opportunities for other businesses to move into. The document adresses in particular SDG10 on reduce inequailities, 12 on responsible production and consumption, 13 on climatechange and 14 on life below water. 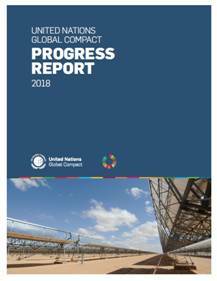 Il Progress Report is published annually to measure the UNGC participants’ progresses towards the integration of UNGC 10 Principles into their strategies, culture and operations and the achievement of the SDGs. Based on a survey targeting more than 1000 companies, the document outlines a picture of the state of art of sustainability integration into business models at global level. Celebrating the 70th anniversary of the Universal Declaration of Human Rights, the report highlights insight and initiatives by Global Compact Local Networks around the world, presents snapshots of good practice from companies participating in the UN Global Compact and showcases initiatives that are advancing the UN Guiding Principles on Business and Human Rights. The document provides guidance for business and Government to fast track zero-carbon economic growth. More and more businesses are seeing opportunity in the zero-carbon economy and taking action on climate change. Governments must use this as a strong vote of confidence and advance ambitious policies that provide companies with the clarity and confidence they need to unlock further investments in climate solutions. 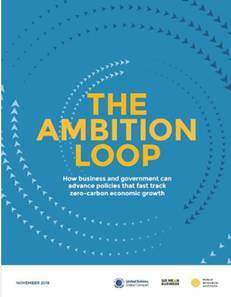 This is the “ambition loop” — a positive feedback loop in which bold Government policies and private sector leadership reinforce each other, and together, take climate action to the next level. 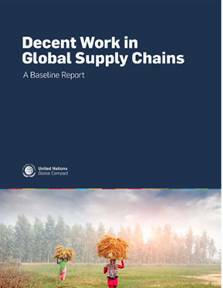 Based on the experiences of the participants to the UNGC Action Platform on Decent Work in Global Supply Chains, the report presents insights into some of the key challenges and opportunities that companies face in their efforts to develop more sustainable procurement strategies. 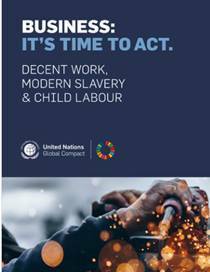 It also offers practical examples of steps taken to combat pressing human rights issues in supply chains, such as modern slavery, child labour and non-compliance with employment standards. 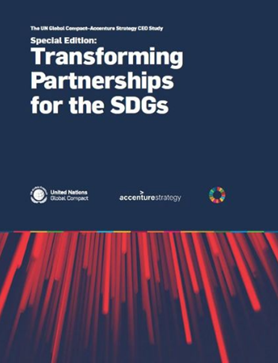 The document provides a list of concrete actions that different stakeholder groups — including business, the investor community, Governments, the UN and civil society — can take to scale up business action and investment in high-risk areas. It also provides an overview of eight multi-stakeholder initiatives that supports take holders in scaling up these actions. 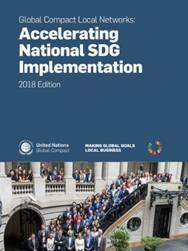 The report collects more than 30 initiatives undertaken by the UNGC Local Networks around the world to support national enterprises and organizations in their pathway towards the SDGs’ implementation, fostering knowledge and pratcices sharing and advancing partnerships and collective actions. This brief guide, developed as part of the Decent Work in Global Supply Chains Action Platform, offers a quick overview of the steps businesses can take to help eliminate modern slavery, while high lighting key resources, initiatives and engagement opportunities to support business action. 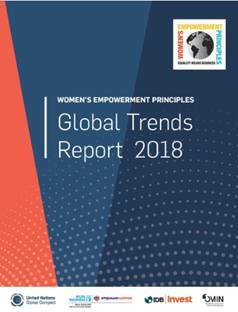 The document examines the aggregate results of companies using the Women's Empowerment Principles Gender Gap Analysis Tool (WEPsTool) with an aim to provide insights on global corporate performance on gender equality and women's empowerment aligned with the Women’s Empowerment Principles, elaborated by UNGC e UN Women. The guide outlines a three-stepprocess to embed the Sustainable Development Goals (SDGs) into existing business and reporting processes. It helps business to better report their impact on the SDGs and address the information needs of relevant stakeholders. 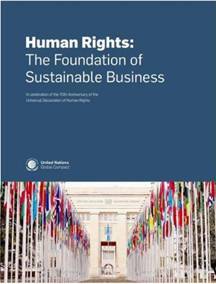 The document follows an approach that is aligned with the UN Guiding Principles on Business and Human Rights and the GRI Standards. 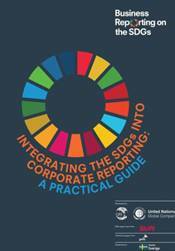 The report feature srecommendations on how corporate reporting on the Sustainable Development Goals (SDGs) can best address investors’ information needs. 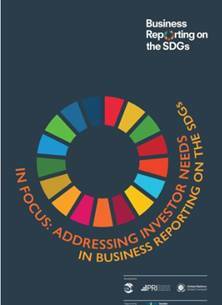 By helping inform investors' decision-making process, corporate SDG reporting can stimulate more investment in sustainable business solutions to help advance the Global Goals. This report is based on a series of interviews with UN leaders and their private sector counter parts; a survey of UN agency heads; and an accompanying information-gathering exercise with partnership practitioners in more than 35 entities across the UN system. This survey of senior leaders across the United Nations explores their views on partnership challenges and opportunities, identifying best practices, management strategies and impact measurement techniques. Takes stock of the contribution of UN Global Compact business participants towards sustainable development. The report assesses progress in terms of how companies are taking action on the Ten Principles and the Sustainable Development Goals, and features ten interviews with disruptive business leaders. It also highlights ten focus areas for the future where further business engagement is needed. The Blueprint for Business Leadership on the SDGs aims to inspire all business — regardless of size, sector or geography — to take leading action in support of the achievement of the Sustainable Development Goals (SDGs). It illustrates how the five leadership qualities of Ambition, Collaboration, Accountability, Consistency, and Intentional can be applied to a business' strategy, business model, products, supply chain, partnerships, and operations to raise the bar and create impact at scale. The Blueprint is a tool for any business that is ready to advance its principled approach to SDG action to become a leader. 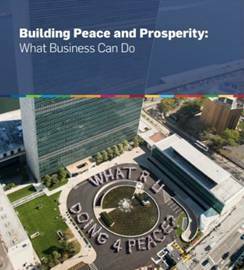 Provides an inspirational overview of the UN Global Compact’s multi-year journey to “Make Global Goals Local Business” by driving awareness and responsible business action to support the achievement of the Sustainable Development Goals by 2030. Guide to finding new partnerships and enhancing existing ones. With 10 inspiring examples of UN-Business collaboration, tips to plan your own partnerships, and directions for finding UN partners to work with, your journey awaits you. Document which illustrates the philosophical and practical connections between the UN Global Compact Ten Principles and the United Nations Sustainable Development Goals (SDGs) for 2030. Supporting tool for businesses which intend to develop a strategic approach to the Development Goals – SDGs and contribute to the sustainable development through their core business activity. The SDG Compass provides guidance for companies on how they can align their strategies as well as measure and manage their contribution to the realization of the SDGs.